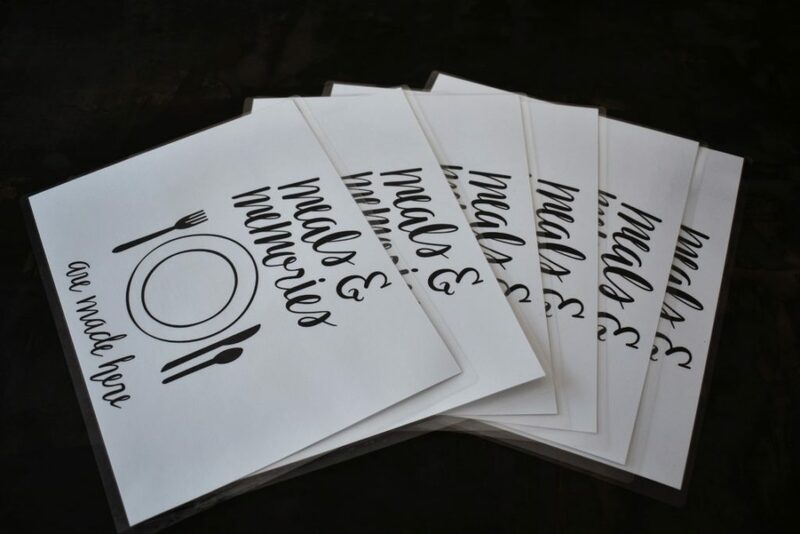 Make these fun and easy kid-friendly educational placemats to foster manners, healthy eating, and conversation at dinner time! Hello! 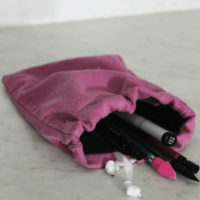 I’m Kimberly from Bugaboo Creates (formerly bugaboo, mini, mr and me). 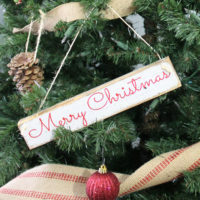 Over on my blog, I share the creative endeavors of my crazy family of 6 – from kids’ crafts to DIY home projects to holiday DIY’s, sewing, recipes and more! We love to make things, and I love to photograph it all. Today I’m so excited to share a project that I love, that’s so easy to make using some of LZ’s beautiful SVG files. First, create a download your SVG and image files. 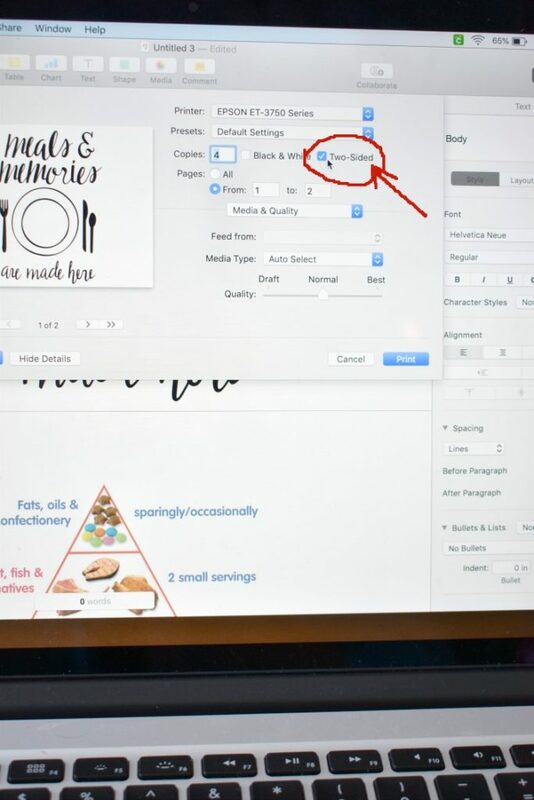 Put them into a two page document, landscape orientation, one file on each page. Make sure your printer is set to print two-sided. 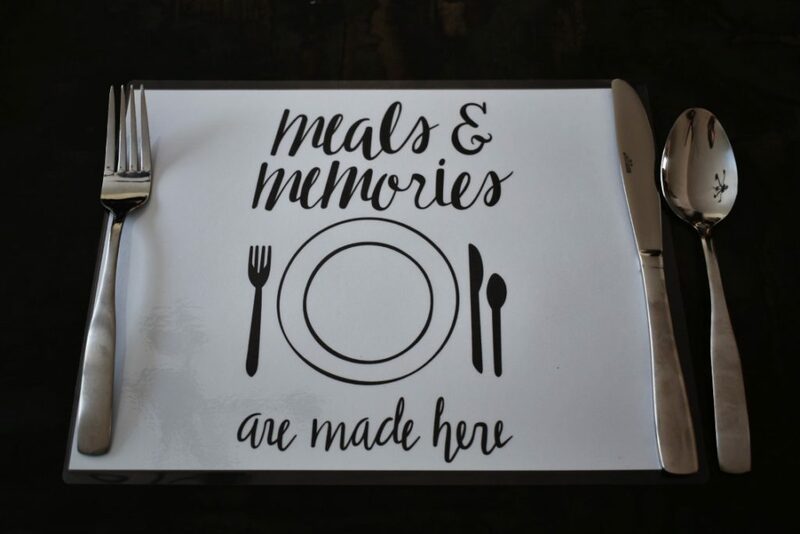 Print out a placemat for every person in your family. 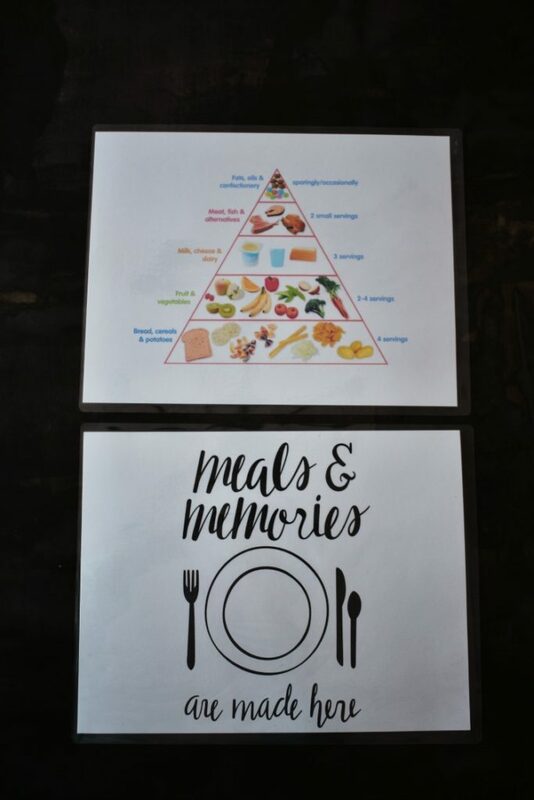 They should have the “meals and memories made here” on one side and the food pyramid on the other side. Now, sandwich them into your thermal laminator pouches. 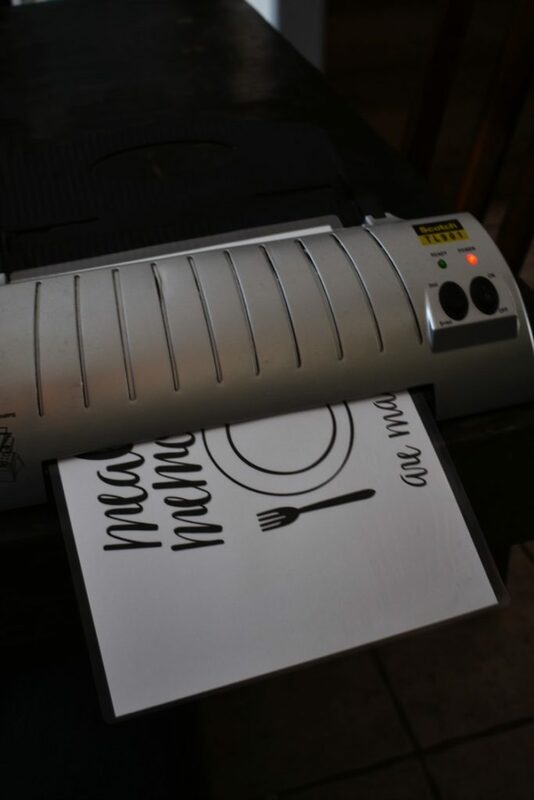 Run the kids’ placemats through the laminator, one at a time. If there are bubbles or places that aren’t as smooth as you’d like, just run it through a second time. 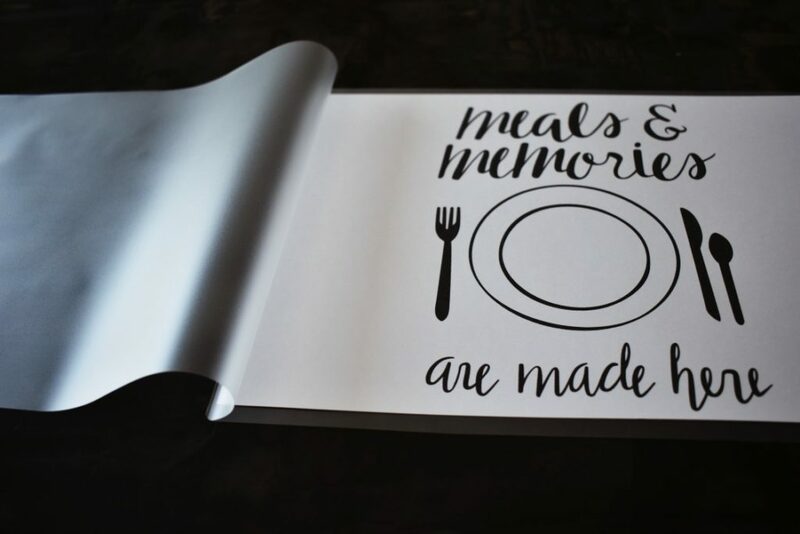 Once they are all done going through the laminator, you should have enough placemats for the family! Set the table! 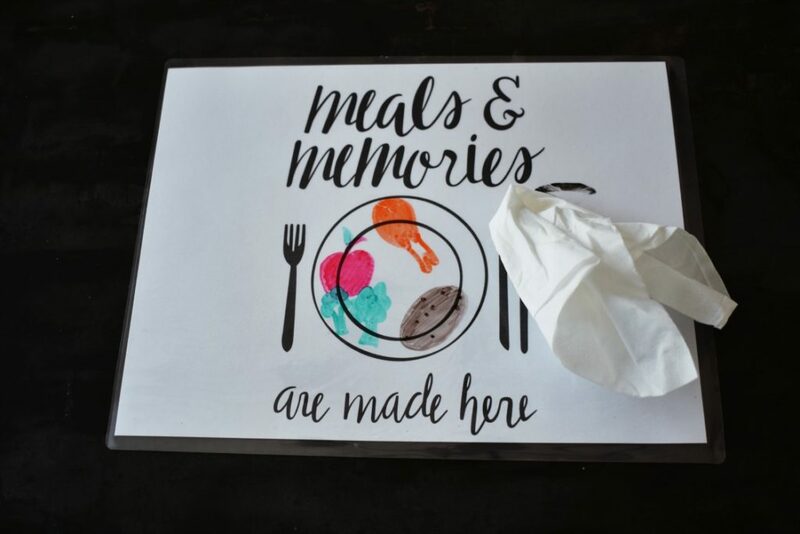 My kids think setting out placemats is super fancy, and they like setting the table more when we use them. And then place the plate and cup after. Table-setting etiquette made easy! 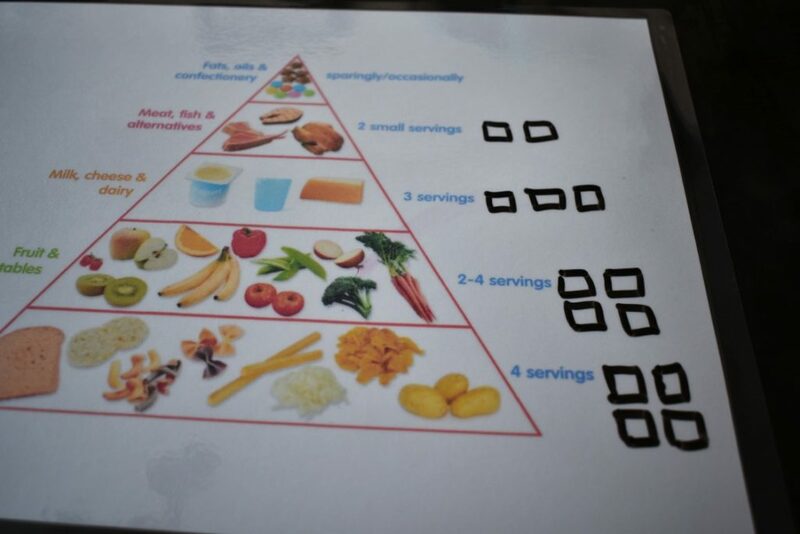 We also use the placemats to talk about healthy eating. Getting your children involved is one of the best ways to encourage good eating habits. 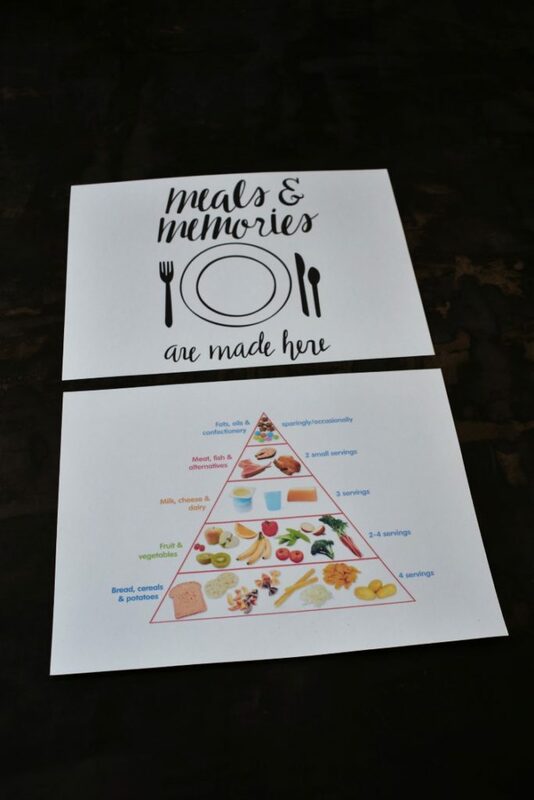 They can look on the pyramid and then draw their version of a healthy meal on the plate. 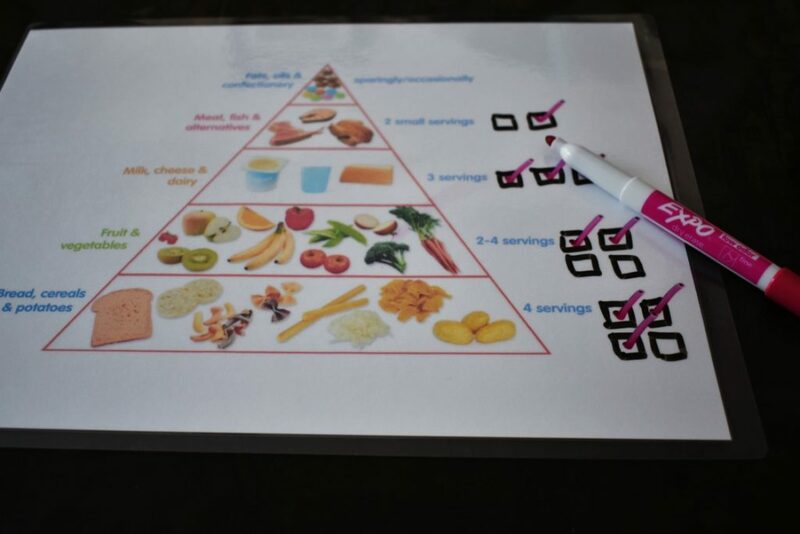 Sometimes I make checkboxes on the placemats next to the food pyramid levels, and have the kids check off how many servings of each they’ve had that day. And then you can just erase it all off for next time! 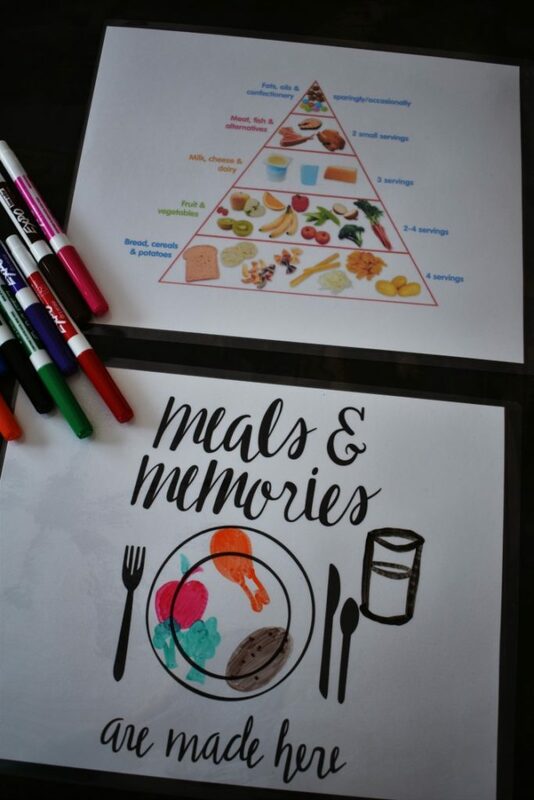 On top of teaching them about nutrition and eating a balanced diet, we also use these kids’ placemats during the meal to have a little more fun at dinner time. 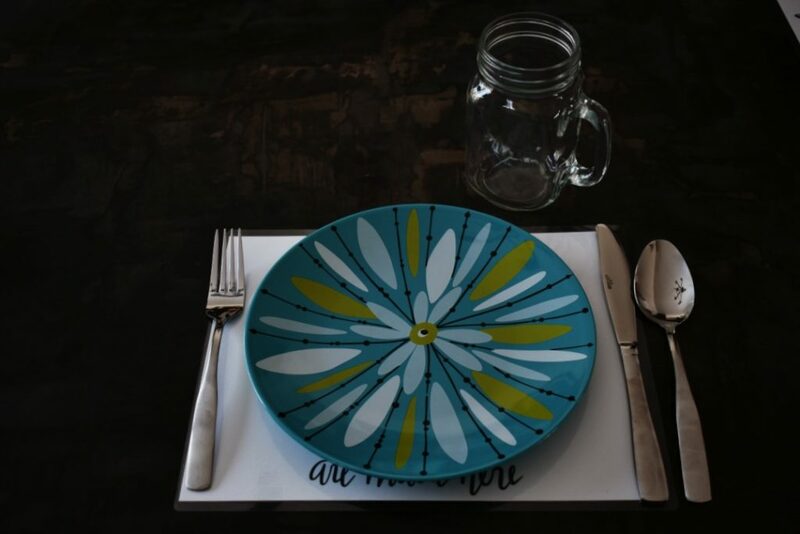 We either have the kids write down or draw a picture of a question they want everyone to answer, then during the meal we take turns moving our plates to reveal the next question we’ll all answer! 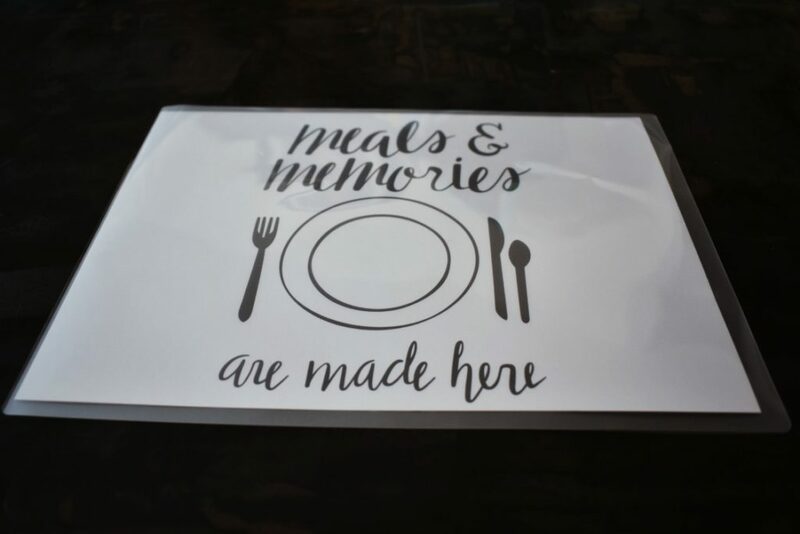 We also sometimes write or draw our favorite family memories. 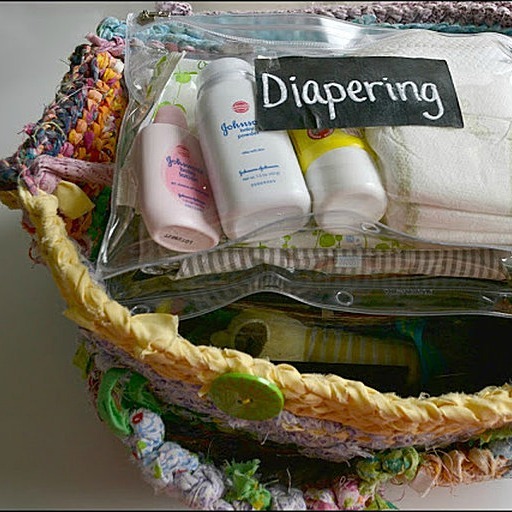 A gift for mom and baby. Getting Sharpie Out of a Sofa: When the 2 Yr Old Strikes. 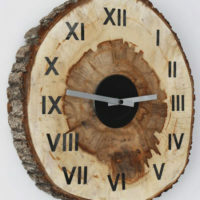 Don’t forget to check out a few of these ideas too! 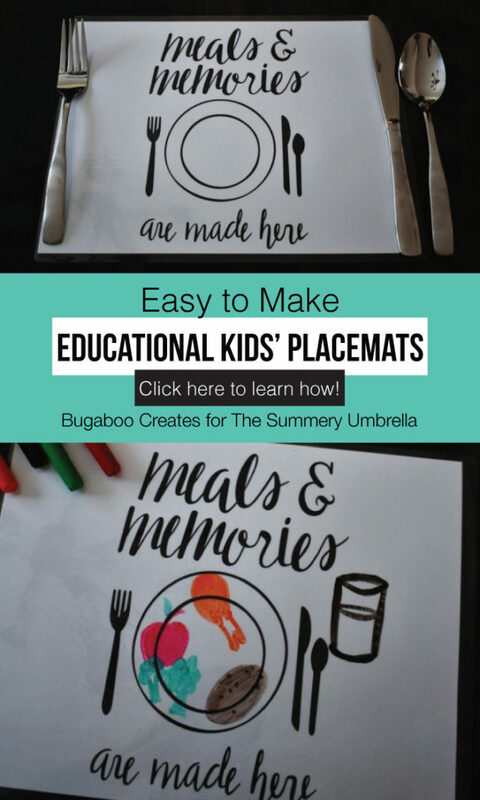 Kimberly is the creative force behind the blog Bugaboo Creates, where she chronicles her adventures in DIY, crafting, sewing and photography. 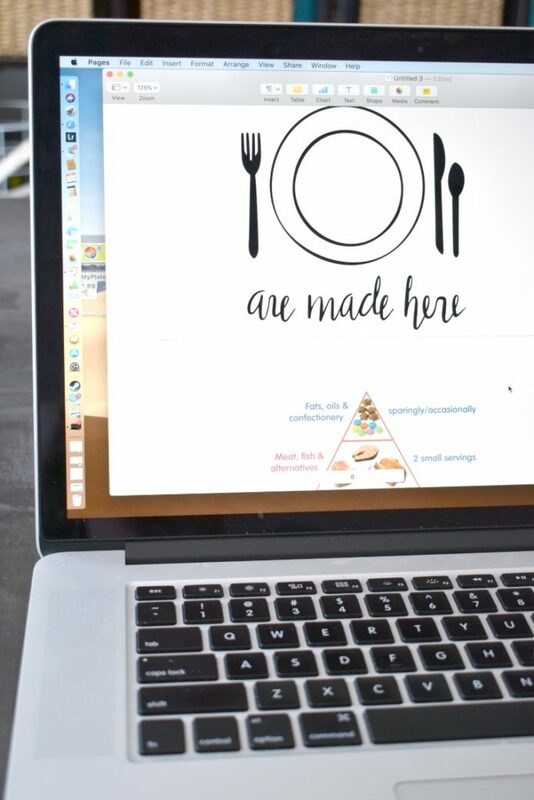 She loves the creative process and writing, so an artsy/craftsy blog is the perfect fit! 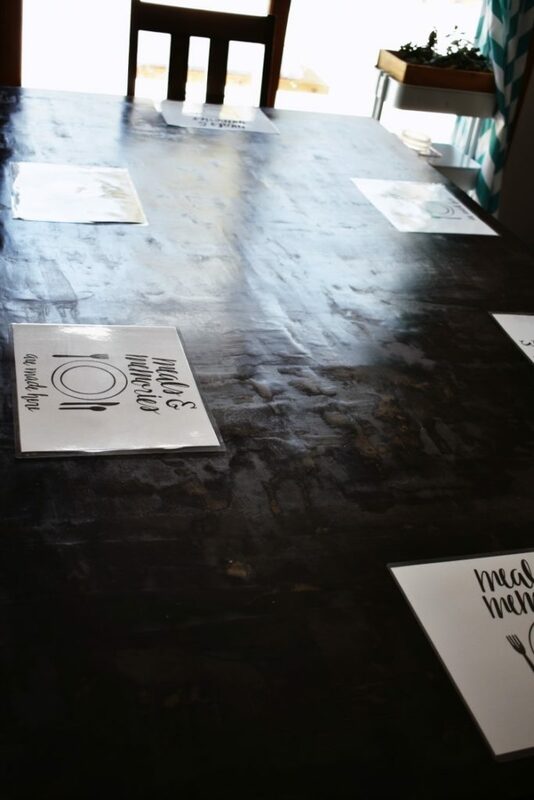 She is always looking for the next way to spend her creative energy, and has newly discovered a love of hand-lettering, party planning and large home DIY projects. She lives in Wisconsin with her love, her four crazy kids and a cat. They join in her crazy schemes as often as they can.